This Sebo vacuum cleaner is perfect for leaving floors spotless – both quickly and easily. It’s also exclusive to Euronics and agent stores, so you won’t find this fantastic model at any other retailer. Upright vacuum cleaners offer a range of benefits over cylinder models. They’re particularly good at removing dirt lodged into carpets, and offer larger dustbin capacities – so you can spend less time emptying and more time cleaning. This model is also bagged and hassle-free – so when it’s full, all you need to do is swap the bag with a new one. The 91533GB uses Sebo’s Ultra bags, which deliver optimum performance and hygienic, S-class filtration. A long, 10 metre cable and wide, 11 metre cleaning radius equal less plug swapping, so you can whiz through your vacuuming in no time. Plus, a longer flex means the cable is less likely to lift off the floor if pulled tight, which cuts the risk of knocking things over. Delivering optimum suction no matter the floor, this Sebo vacuum cleaner will adjust the brush’s height automatically. When you’re on carpets, the brush will lift, and when you’re on hard floors, the brush will lower. Unlike many upright cleaners, the Sebo X7 also cleans flat to the floor. This means it can clean under furniture as effectively as a cylinder vacuum. Coming with an integrated, extra-long hose and wand, the 91533GB can clean stairs, awkward crevices and under furniture. It is particularly good at reaching high ceilings to remove irritating cobwebs with ease. You’ll even find a range of attachments with this vacuum cleaner, including a crevice nozzle, dusting brush and clamp, as well as an upholstery nozzle. This cleaner also comes with a pack of Sebo Fresh perfume capsules. 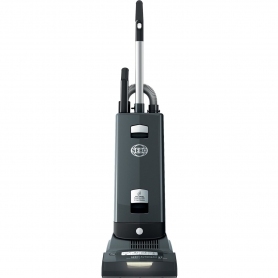 A powerful, 890 watt motor drives the 91533GB, ensuring fantastic results every time you clean. The Sebo brand is known for its reliability and high design standards, so you can be assured your product will work at its best – time and time again. This vacuum cleaner also features a Computer Control System to protect your machine. For example, if there’s a blockage, this system will shut down the cleaner. And, the cassette brush roller is easy to remove for quick and simple cleaning. The 91533GB Sebo vacuum cleaner offers great performance and convenience. Put one in your shopping basket today.